There’s a lot to love about our neighbors to the north: Wayne Gretzky, SCTV, Michael J. Fox. Even though it’s only got a tenth of the population of the U.S., Canada has contributed much to American pop culture both good and bad, but one of its major contributions has come in the form of AOR: Album-oriented radio. As discerning Popdose readers no doubt already know, AOR was an FM radio format that took hold in the 1970s focusing on album rock. In its heyday in the ’70s and ’80s, AOR allowed DJs to dig deeper into albums to highlight songs that weren’t necessarily considered single-worthy. Eventually, the format became a lot more tightly controlled and there was much less freedom to play so-called deep tracks. In the late ’80s and early ’90s, AOR started to fade as other formats emerged: modern (or alternative) rock, adult alternative and active rock, which focused on harder-edged music. The AOR sound was born from progressive rock, the freeform format that came out of the 1960s in which a DJ could play an album side, a 10-minute song or basically whatever he or she felt like. As time wore on, AOR became much more predictable and homogenous, which led to the birth of many genres including punk rock. But that’s not to say it wasn’t enjoyable. In this series, we’re going to take a look at the seemingly endless parade of Canadian AOR artists that didn’t necessarily hit it big in the States but nevertheless made an indelible impression on our ears in the 1970s and ’80s. That means we won’t be taking on better-known acts like Rush, Bryan Adams or even Loverboy, but we’ll have some fun digging through the crates to document classic Canuck AOR acts: From Red Rider to Trooper, from Streetheart to Frozen Ghost, from Coney Hatch to Platinum Blonde. So grab a Coffee Crisp and a Molson Ice, sit back and enjoy the ride, eh? For our inaugural entry, let’s check out a pioneering hard rock act that has been plying its trade for four-plus decades now. In March 1977, the band opened a secret show played by the Rolling Stones at the El Mocambo club in Toronto, which later became part of the Stones’ Love You Live album; April Wine’s set was immortalized on its Live at the El Mocambo release. But it wasn’t until the summer of ‘77, when Brian Greenway joined to give the band a three-guitar attack along with Goodwyn and Gary Moffet, that April Wine’s most potent lineup was in place. Most of its material was original, but the band wasn’t averse to covering songs by other artists including Hot Chocolate (“You Could Have Been a Lady”), Lorence Hud (“Sign of the Gypsy Queen”) and even King Crimson (“21st Century Schizoid Man”). The band found minor success in the U.S. in the early ’80s thanks to the early days of MTV, when the fledgling cable channel was starved for music videos to fill its 24-hour schedule. 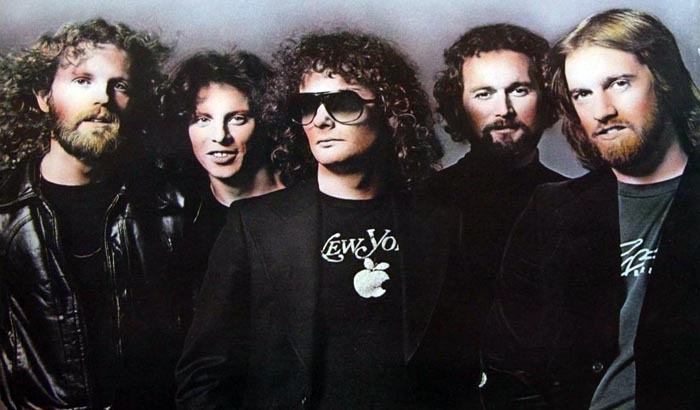 MTV’s August 1981 debut coincided with April Wine’s Nature of the Beast album, which came out that same year and was making inroads on AOR stations. Indeed, “Just Between You and Me” was the 14th video played on MTV’s first day on the air. Videos from the band’s previous albums and the Live in London concert also received a fair amount of airplay, and constant touring with the likes of Rush, Styx and Nazareth built a solid fanbase. Beauty, eh? : The three-album run of 1978’s First Glance, 1979’s Harder Faster and 1981’s The Nature of the Beast was April Wine at its best: Solid, hard rock songs featuring big riffs and hot solos that could rattle the boogie van, throwing in the occasional ballad ideal for a high school slow dance. Permed and bemulleted (except for bald drummer Mercer, who as one YouTube commenter astutely noted, appeared like he took a time machine from 2015 to the ’70s), the band could deliver the goods to rock fans who liked party rock that could get heavy without getting deep. Sorry: The song “If You See Kay” off 1982’s Power Play was rock innuendo at its dumbest, but 15-year-olds thought it was cool. Still, the band’s 1984 follow-up Animal Grace was a big disappointment, as apparently Goodwyn had moved to the Bahamas and a rift developed between him and the other band members. Animal Grace was a pretty flat record, and the subsequent tour was dubbed the band’s farewell jaunt. Meanwhile, hair metal began to dominate the arenas and radio/video playlists that the Wine once appeared on regularly. Despite that, Goodwyn has kept the April Wine name going over the last 30 years with rotating band lineups and the occasional album, but has never approached any modicum of success comparable to those glory years of the late ’70s/early ’80s. Where? : The current incarnation of April Wine led by Goodwyn and Greenway currently tours in Canada and occasionally plays festivals elsewhere. The glory days have long passed, but the band has cemented its place in Canadian and AOR history.